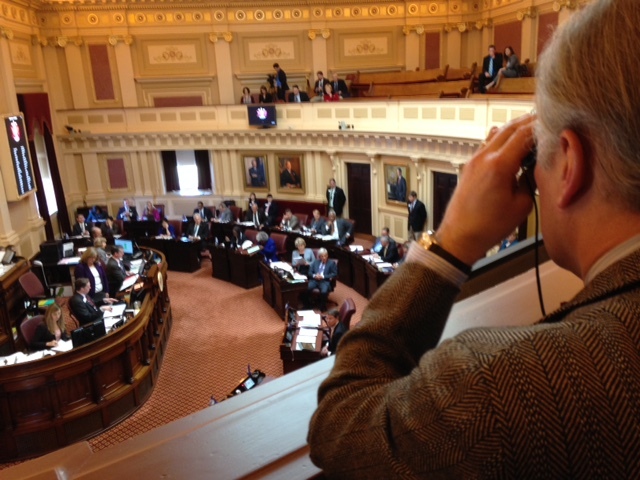 RICHMOND, VA–When and where did a pair of binoculars become standard equipment for a political journalist? Last week, at the Virginia Capitol. The Virginia General Assembly, the world’s oldest deliberative body, convened for its 2016 session on Jan. 13, and reporters who cover the statehouse got a surprise. Without notice and without explanation, the Republican majority (a 21-19 advantage) adopted a new rule: Reporters would no longer work from tables on the Senate floor; they were banished to the gallery above the chamber. The practice of allowing reporters on the floor of the Senate dates back for decades. The journalists can follow the action and they have ready access to senators for interviews. Toward the end of a session, when a glut of legislation faces a deadline, floor placement allows quick access to substitute versions of bills and amendments. Senate Majority Leader Tommy Norment, R-James City County, put an end to that. Norment has enjoyed prickly relations with reporters over the years. Exactly why he did this is not hard to figure: It’s a poke in the eye at the press that has reported on his cozy relations with business, apparent favors granted and his sometimes messy personal life. Because of this strike at the press, he has guaranteed that any story reporting the new rule will need to explain the strained relationship and dredge up all that history. Norment isn’t alone in trying this press-unfriendly tactic. Republicans who control the Missouri Senate have done the same thing, according to an article in Columbia Journalism Review. In the Show-Me State, reporters will move March 29 from a table on the Senate floor to the gallery above. Last year, they were booted from first floor offices to the fifth floor, where there is no elevator access. Jeff Schapiro, who covers politics for the Richmond Times-Dispatch, brought a little theater to the new arrangement in Richmond. The day after the new rule was adopted he was in the cramped new press space with a pair of binoculars to cover the action 20 feet below. My office is a couple of blocks from the Virginia Capitol, a grand building designed by Thomas Jefferson. One wonders what Mr. Jefferson would think of the new restrictions on press access. • To get to the balcony, one has to ride one of two elevators three flights or climb as many flights of steep stairs. • Reporters are confined to the far corners of the balcony, with five seats each on either side. • You can’t see half of the Senate when you’re there. On each side, there is one electrical plug with two outlets. For long sessions, reporters better have a spare battery, maybe two or three, for their laptops and cellphones. • The television people, with their cameras, will take up more space than just a single person. • When things really get rolling, 10 seats may not be enough. Any additional space will eat into the seating allotted for the public. • To get copies of floor amendments or substitute measures, so one is going to need to run up and down the aforementioned stairs, unless the elevators get to be lightning-fast. • To buttonhole senators after a session breaks up, one is also going to need to run down those same steps before they slip away. Will Norment’s rule make it impossible to cover the Senate? No, but it will make it more difficult. And it’s the attitude behind this stunt that is troublesome. This doesn’t just hurt the press and the journalists who cover the Senate. Reporters are the public’s eyes and ears when the Assembly is in session. Virginia has a part-time legislature, so that isn’t for a long period of time. Twenty other senators went along with this. Schapiro reported in his Jan. 17 column in the T-D that no other Republican senator is publicly defending the new rule…they want to change the subject. Democrats in the Senate oppose the rule, and it’s especially distressing to think that press access and press freedom has become a partisan issue. I talked with Sen. Creigh Deeds, D-Bath County, as we left the General Assembly Thursday. With his binoculars, Schapiro got the attention of the Senate leadership. Word was senators’ laptops may be outfitted with privacy screens to prevent any view from above. Norment didn’t like the binoculars. “Why do you keep doing that crap?” he asked Schapiro. That’s a question we’d all like to ask the Senate Majority Leader.